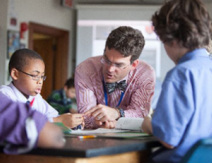 JT Miller, Lower School Science Teacher, joined the St. Albans staff in August 2012. Previously he taught high school physics in Washington, DC, Middleville, MI and Walpole, MA for nine years. He believes that science is all around us and knows no other professional home than the classroom. He is an active member of the National Science Teacher Association (NSTA), International Society for Technology in Education (ISTE), and the Planetary Society. In addition to teaching in a traditional educational setting, he has worked extensively with youth in experiential educational environments. As a year-long volunteer in Johannesburg, South Africa, he taught life skills to at-risk youth. Over the course of five summers, he worked at Catalina Island Marine Institute (CIMI) where he introduced students to marine life first hand through snorkeling, sailing, and interactive aquarium labs. He holds a Bachelor of Arts in physics from Gettysburg College and a Master of Arts in Teaching from Tufts University.